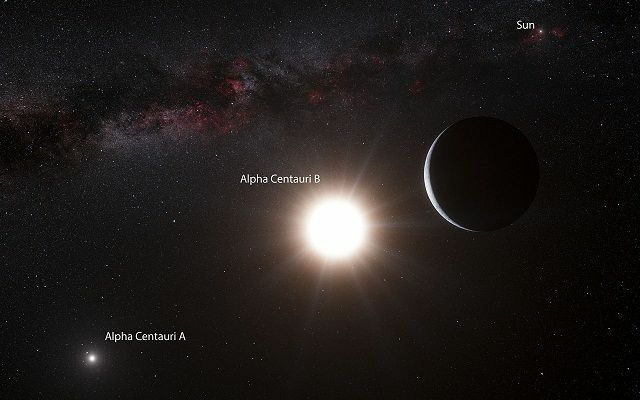 On March 25, 2015, a team of astronomers using the Hubble Space Telescope revealed observations which indicate via the transit method that Alpha Centauri B may have a second planet "c" in a hot inner orbit, just outside planet candidate "b." After observing Alpha Centauri B in 2013 and 2014 for a total of 40 hours, the team failed to detect any transits involving planet b (previously detected using the radial velocity variations method and recently determined not to be observed edge-on in a transit orbit around Star B). Transit signals detected in 2013 observations indicate that planetary candidate c could be an Earth-sized planet with a year lasting no more than 20.4 days, putting it slightly further out than Bb but still scorchingly close to the star (Demory et al, 2015; and Jacob Aron, New Scientist, March 27, 2015). 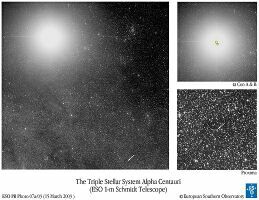 On March 5, 2015, a team of astronomers announced that numerical simulations constrain the size of planetary candidate Alpha Centauri Bb (with orbital period P=3.24 days; and semi-major axis a = 0.042 AU) to less than 2.7 Earth-masses at an inclination of 45 to 53 degrees relative to Stars' AB orbital plane (Plavchan et al, 2015). Found via radial velocity variations, the planet's true mass could not be known with knowing whether its orbit around Star B is being viewed edge-on, face-on, or somewhere in between. The team's computer simulations indicate that the planet's orbit isn't face-on, which constrains its mass to one to 2.7 times that of Earth, implying that it has a terrestrial composition but its tidally locked day side should be hot enough to melt lead (Ken Croswell, Science Magazine, March 11, 2015). around Alpha Centauri B (more). On October 16, 2012, a team of astronomers announced the discovery of a planet with around 1.13 +/- 0.09 Earth-masses in a very hot and tight, circular orbit around Alpha Centauri B, using the European Southern Observatory's High Accuracy Radial velocity Planet Searcher (HARPS) instrument on the 3.6-metre telescope at ESO’s La Silla Observatory in Chile. Due to the close binary orbital interactions of the host star with Alpha Centauri A and Star B's own increased stellar activity during recent years, the astronomers were only able to detect the radial-velocity variations of host star B that were caused by the 3.236-day orbit of the planet (with a semi-major axis of 0.04 AU) only after more than three years of careful observation. Given that the presence of one close-orbiting planet usually indicates the presence of others, many astronomers are now expected to devote more resources to detecting such potential planets around Star B (ESO press release; Dumusque et al, 2012; Eric Hand, Nature, October 16, 2012; and Aron Jacob, New Scientist, October 17, 2012; and Astronomy Picture of the Day). Sol's three closest stellar neighbors are located in the southeastern corner of Constellation Centaurus, the Centaur. Proxima Centauri (or Alpha Centauri C) is only 4.22 light-years (ly) away (14:29:42.95-62:40:46.14, ICRS 2000.0) but is too dim to be seen with the naked eye. The two bright stars, Alpha Centauri A and B (14:39:36.5-62:50:02.3 and 14:39:35.1-60:50:13.8, ICRS 2000.0), are a little farther away at about 4.36 ly. They form a close binary that is separated "on average" by only about 24 times the Earth-Sun distance -- an average orbital distnace or semi-major axis of 23.7 astronomical units (AUs) -- which is only slightly greater than the distance between Uranus and the Sun ("Sol"). 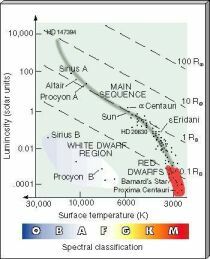 In contrast, Proxima (Star "C") is located around 15,000 +/- 700 AUs from Star A and B. This is so far that Proxima may not be gravitationally bound to Star A and B and so may leave the system after some million years, and according to Anosova et al (1994), all three stars may be part of a stellar moving group of nearby stars that includes: the triple ADS 10288 (Gl 649.1); the binaries, Gliese 140.1 and 676; and six single stars. A subsequent analysis using the most recent kinematic and radial velocity data available in the literature, however, found Proxima "is quitely likely" to be bound to to Stars A and B based on calculations of the binding energy of Proxima relative to the center of mass of the entire triple system, where its orbital semi-major axis exceeds 10,000 AUs and is "on order the same size as Alpha Centauri AB's Hill radius in the galactic potential" (Wertheimer and Laughlin, 2006). Hence, it is quite likely that all three stars formed together from the same nebula at roughly the same time and so should share a similar elemental composition. than the planet Jupiter (more). Being visible to the naked eye, Alpha Centauri has been known for centuries, if not millennia, although perhaps not as a double star until the 1752 observation of the Abbé [Abbot] Nicholas Louis de La Caille (1713-1762) from the Cape of Good Hope, the southernmost point of Africa, where he was studying the stars of the southern hemisphere with just an half-inch (8x) refractor. Dim Proxima, however, was not discovered until 1915 by Robert Thorburn Ayton Innes (1861-1933) of Edinburgh, Scotland who also was observing from Cape Hope, probably with the 7-inch refractor at the Royal Observatory. 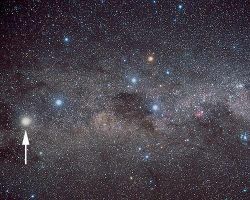 If our own Sun, Sol, were viewed from the Alpha Centauri system, it would be located in Cassiopeia near the border with Perseus and about five degrees north of a double cluster near the nebula IC 1805/1848, visible as a bright yellow star that would be almost as bright as Capella (Alpha Aurigae) appears in Earth's night sky. (H-R diagram with Star B). 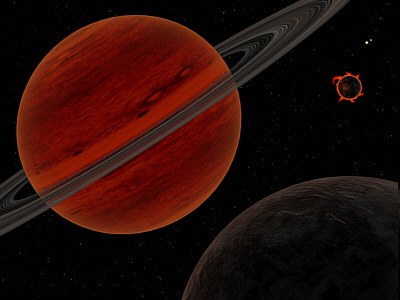 Due to their proximity to Sol, the stars of this system have been objects of intense interest among astronomers. Stars A and B were selected as two of the top 100 target stars for NASA's indefinitely postponed Terrestrial Planet Finder (TPF) to directly image small rocky planets in Earth-type habitable orbits. In addition, all three stars (including Proxima) were among the "Tier 1" target stars for NASA's optical Space Interferometry Mission (SIM) to detect a planet as small as three Earth-masses within two AUs of its host star (and so some summary system information and images on Stars A, B, and C are available from the SIM Teams), but the SIM project manager announced on November 8, 2010 that the mission was indefinitely postponed due to withdrawal of NASA funding. Astronomers are also hoping to use the ESA's Darwin group of infrared interferometers to analyze the atmospheres of rocky planets found in the "habitable zone" (HZ) around all three stars for evidence of Earth-type life (Lisa Kaltenegger, 2005). Larger illustration of the TPF. The distance separating Alpha Centauri A from its companion star B averages 23.7 AUs (semi-major axis of 17.57" with a HIPPARCOS distance estimate of 4.40 light-years). The stars swings between 11.4 and 36.0 AUs away in a highly elliptical orbit (e= 0.52) that takes almost 80 (79.90) years to complete and are inclined at an angle of 79.23° from the perspective of an observer on Earth (see Pourbaix et al, 2002, or 2000 in the Sixth Catalog of Orbits of Visual Binaries; and Worley and Heintz, 1983). As viewed from a hypothetical planet around either star, the brightness of the other increases as the two approach and decreases as they recede. However, the variation in brightness is considered to be insignificant for life on Earth-type planets around either star. At their closest approach, Stars A and B are almost two AUs farther apart than the average orbital distance of Saturn around the Sun, while their widest separation is still about six AUs farther the average orbital distance of Neptune. In a binary system, a planet must not be located too far away from its "home" star or its orbit will be unstable. If that distance exceeds about one fifth of the closest approach of the other star, then the gravitational pull of that second star can disrupt the orbit of the planet. Recent numerical integrations, however, suggest that stable planetary orbits exist: within three AUs (four AUs for retrograde orbits) of either Alpha Centauri A or B in the plane of the binary's orbit; only as far as 0.23 AU for 90-degree inclined orbits; and beyond 70 AUs for planets circling both stars (Weigert and Holman, 1997). Hence, under optimal conditions, either Alpha Centauri A and B could hold four inner rocky planets like the Solar System: Mercury (0.4 AU), Venus (0.7 AU), Earth (1 AU) and Mars (1.5 AUs). Indeed, the AB system is significantly more enriched (1.7 to 1.8 times) in elements heavier than hydrogen ("high metallicity") than our own Solar System (Chmielewski et al, 1992; Cayrel de Strobel et al, 1991, page 297; Furenlid and Meylan, 1984; and Flannery and Ayres, 1978). 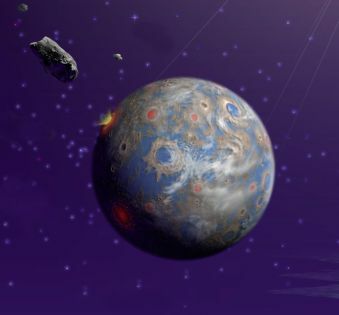 Hence, either stars A or B could have one or two "rocky" planets in orbital zones where liquid water is possible. Astronomers are hoping to use NASA's Terrestrial Planet Finder (TPF) and the ESA's Darwin planned groups of observatories to search for rocky inner planets in the so-called "habitable zone" (HZ) around both Stars A and B. 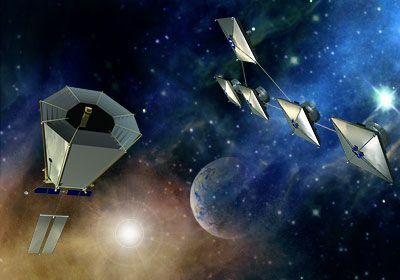 As originally proposed, the TPF will include two complementary observatory groups, a visible-light coronagraph and a "formation-flying" infrared interferometer, while Darwin would launch a flotilla of three mid-infrared telescopes and a fourth communications hub. 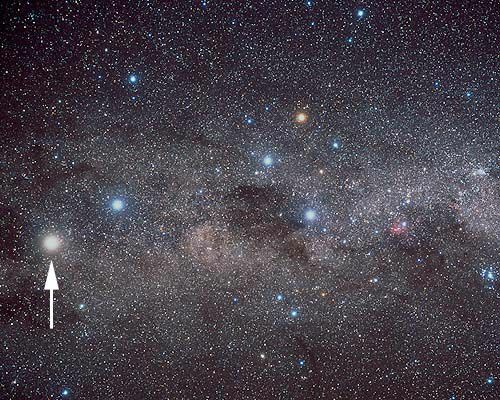 Rigil Kentaurus ("Foot of the Centaur" in Arabic) is the fourth brightest star in the night sky as well as the brightest star in Constellation Centaurus. Like Sol, it is a yellow-orange main sequence dwarf star of spectral and luminosity type G2 V. It has about 1.105 ± 0.007 times Sol's mass (Guedes et al, 2008; and Thévenin et al, 2002) and 1.23 its diameter (ESO science release; and Demarque et al, 1986), and is about 52 to 60 percent brighter than Sol (ESO science release; and Demarque et al, 1986). star like our Sun, Sol. 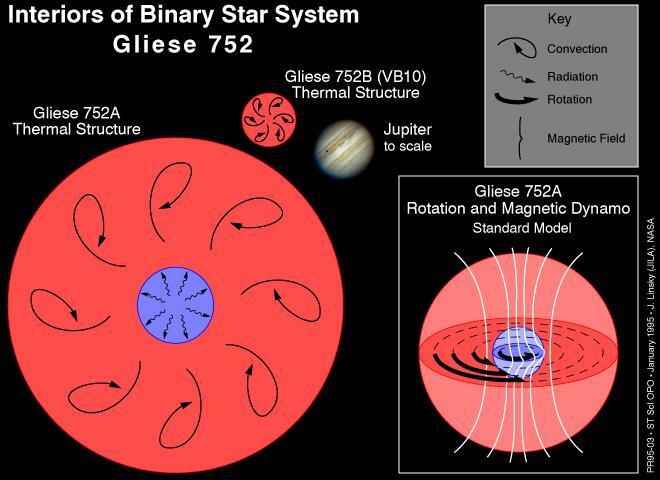 Without consideration of interior seismic constraints, Star A (and B) has been estimated to be older than Sol, from 4.85 billion years in age (ESO) to around 7.6 (+/- around 10 percent) billion years or more -- or 6.8 billion years if it does not have a convective core (Guenther and Demarque, 2000). 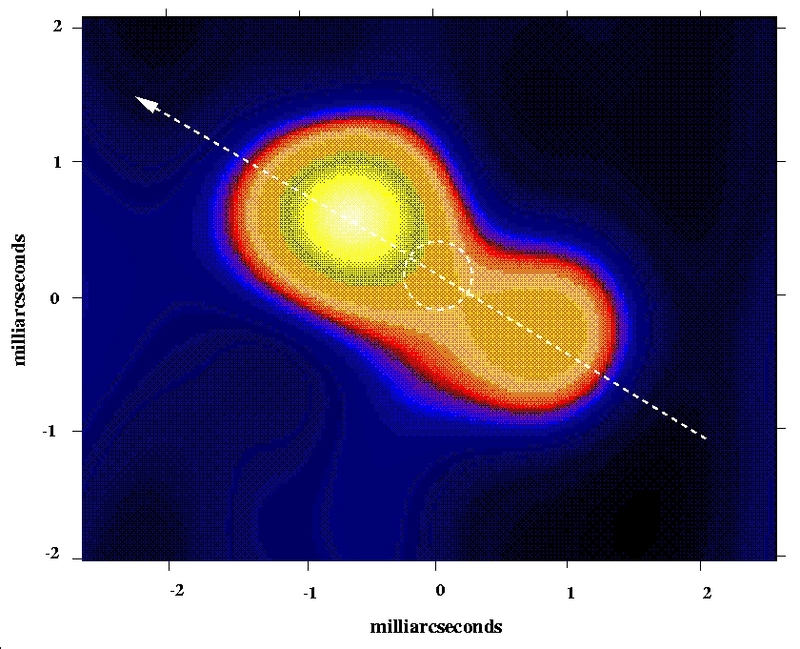 Recent recent interior modeling with seismic constraints, however, suggest that Stars A and B could be 5.6 to 5.9 billion years old (Mutlu Yildiz, 2007). 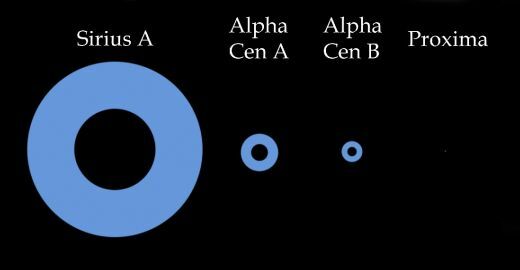 Since Alpha Centauri A is very similar to our own Sun, however, many speculate whether it might contain planets that harbor life. 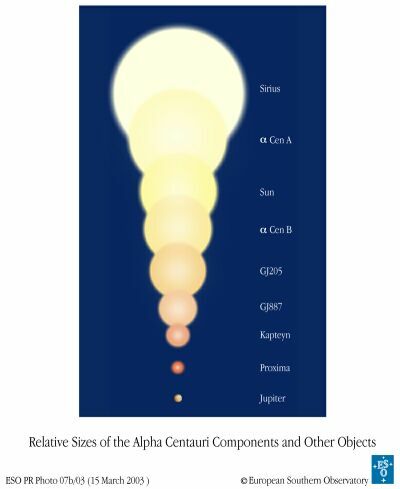 Useful star catalogue numbers and designations for Alpha Centauri A include: Alp or Alf Cen A, Alp1 Cen, HR 5459, Gl 559 A, Hip 71683, HD 128620, CP(D)-60 5483, SAO 252838, FK5 538, and LHS 50. Calculations by to Weigert and Holman (1997) indicated that the distance from the star where an Earth-type planet would be "comfortable" with liquid water is centered around 1.25 AUs (1.2 to 1.3 AUs) -- about midway between the orbits of the Earth and Mars in the Solar System -- with an orbital period of 1.34 years using calculations based on Hart (1979). More recent calculations based on Kasting et al (1993), however, allow for a wider "habitable zone." According to one type of model calculations performed for the NASA Star and Exoplanet Database, the inner edge of Star A's habitable zone should be located around 1.17 AU from the star, while the outer edge edge lies around 2.33 AUs. Viewed from a planet at Earth's orbital distance around Alpha Centauri A, stellar companion B would provide more light than the full Moon does on Earth as its brightest night sky object, but the additional light at a distance greater than Saturn's orbital distance in the Solar System would not be significant for the growth of Earth-type life. This much dimmer companion star is a main sequence, orange-red dwarf (K0-1 V). It appears to have only 93.4 ± 0.7 percent of Sol's mass (Guedes et al, 2008; and Thévenin et al, 2002), about 86.5 percent of its diameter, and 45 to 52 percent of its luminosity (ESO; and Johnson and Wright, 1983, page 681). Useful catalogue numbers and designations for Alpha Centauri B include: Alp or Alf Cen B, HR 5460, Gl 559 B, Hip 71681, HD 128621, and LHS 51. Calculations by to Weigert and Holman (1997) indicated that the distance from the star where an Earth-type planet would be "comfortable" with liquid water is centered around 0.73 to 0.74 AU -- somewhat beyond the orbital distance of Venus in the Solar System -- with an orbital period under an Earth year using calculations based on Hart (1979). More recent calculations based on Kasting et al (1993), however, allow for a wider "habitable zone." Estimates provided by the NASA Star and Exoplanet Database, however, appear to be incorrect for this spectral class K star -- where the inner edge of Star B's habitable zone should be located around 1.20 AU from the star, while the outer edge edge lies around 2.38 AUs, and so estimates from 40 Omicron Eridani A (another K0-1 star) were applied as a rough proxy, which indicated that the inner edge of Star B's habitable zone could be located around 0.56 AU from the star, while the outer edge edge lies around 1.10 AUs. In July 2008, astronomers (Michael Endl and Martin Kürster) analyzed used seven years of differential radial velocity measurements for Proxima Centauri to submit a paper indicating that large planets are unlikely to be orbiting Sol's closest stellar neighbor within its habitable zone -- around 0.022 to 0.054 AU with a corresponding orbital period of 3.6 to 13.8 days. A super-Earth as small as two to three Earth-masses was ruled out with a statistical significance exceeding 99 percent. In addition, their simulations also ruled out the presence of a planet of at least Neptune-class in a circular orbit within one AU of Proxima (Endl and Kürster, 2008). In January 2008, astronomers working cooperatively within the Research Consortium on Nearby Stars (RECONS) issued a press release about their research project to estimate the size of the so-called habitable zone around nearby stars (RECONS press release). Based on the latest data that RECONS has collected on stars within 10 parsecs (32.6 light-years) of Sol, the astronomers are carefully estimating what they call the "habitable real estate" around each of the Sun's neighbors, where inner rocky planets like the Earth can support liquid water on their surface. Confirming previous modelling of the Alpha Centauri system, the RECONS astronomers found that Alpha Centauri A and B orbit in such a way that when the light and heat of the two stars was combined, neither star in the innermost AB system significantly changed the size of their respective habitable zones, regardless of where each was currently located in its orbit. Although stars A and B would be expected to interfere with each others' habitable zones, the areas of the available good "habitable real estate" around each star was affected by less than one percent. Not surprisingly, distant Proxima was completely unaffected by the other two stars. On February 25, 2008, a team of astronomers released a paper on simulation results which support the conclusions of previous studies that multiple-planet systems could have formed in close orbits around both heavy-element rich, Alpha Centauri A and B. Their simulations suggest that at least one planet in the one to two Earth-mass range could have formed within orbital distances of 0.5 to 1.5 AUs around either Star A or Star B; an important finding was that the simulations frequently generated a Earth-like planet in or near Star B's habitable zone (where liquid water could exist on the planet's surface) which can be detected with three to five years of high cadence observations (Javiera Guedes, 2009). 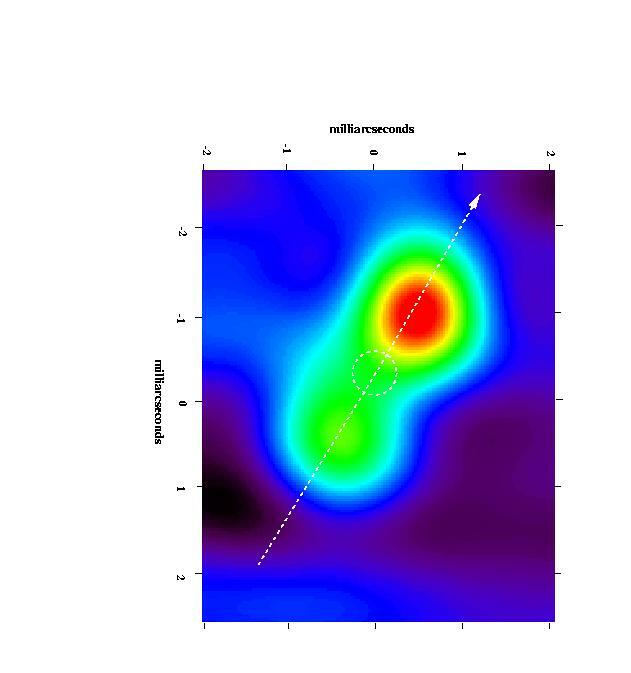 Additional simulation work presented in the paper also indicates that long-term telescopic observations may detect wobbles from such planets using the radial velocity method. Star B, a orange-red dwarf with a relatively calm chromosphere and acoustic p-wave mode oscillations, is an easier target for detecting wobbles from terrestrial planets, possibly within only three years of "high cadence" observations for a 1.8 Earth-mass planet (more from New Scientist and Guedes et al, 2008). On October 16, 2012, a team of astronomers announced the discovery of a planet with around 1.13 +/- 0.09 Earth-masses in a very hot and tight, circular orbit around Alpha Centauri B, using the European Southern Observatory's the High Accuracy Radial velocity Planet Searcher (HARPS) instrument on the 3.6-metre telescope at ESO’s La Silla Observatory in Chile. Due to the close binary orbital interactions of the host star with Alpha Centauri A and Star B's own increased stellar activity during recent years, the astronomers were only able to detect the radial-velocity variations of host star B that were caused by the 3.236-day orbit of the planet (with a semi-major axis of 0.04 AU) only after more than four and a half years of careful observation. Given that the presence of one close-orbiting planet usually indicates the presence of others, many astronomers are now expected to devote more resources to detecting such potential planets around Star B (ESO press release; and Dumusque et al, 2012). of Proxima from Schultz et al, 1998. 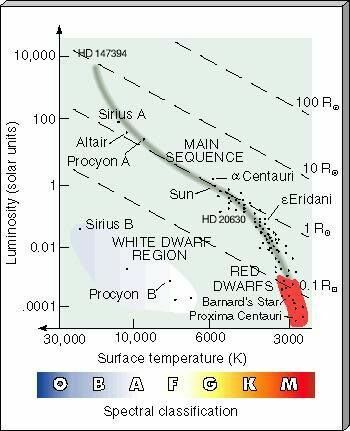 Proxima (Alpha Centauri C) is a very cool and very dim, main sequence red dwarf (M5.5Ve) that appears to have only 0.107 ± 0.021 percent of Sol's mass (Pourbaix et al, 2002) and 14.5 percent of its diameter (ESO press releases of 3/15/03 and 2/22/02; and Doyle and Butler, 1990, page 337). With a visual luminosity that has reportedly varied between 0.000053 and 0.00012 of Sol's (based on a distance of 4.22 light-years)the star is as much as 19,000 times fainter than the Sun, and so if it was placed at the location of our Sun from Earth, the disk of the star would barely be visible. With less than 20 percent of Sol's mass, Proxima is so small that it can transport core heat to its surface only through convection, unlike larger red dwarf stars like Gliese 752 A -- also known as Wolf 1055 A or Van Biesbroeck's Star (more). The star is located roughly a fifth of a light-year from the AB binary pair and, if gravitationally bound to it, may have an orbital period of around half a million years. According to Anosova et al (1994), however, its motion with respect to the AB pair is hyperbolic. Accounting for infrared radiation, the distance from Proxima where an Earth-type planet would be "comfortable" with liquid water is around 0.022 to 0.054 AU (Endl and Kürster, 2008; and Endl et al, 2003, in pdf) -- much closer than Mercury's orbital distance of about 0.4 AU from Sol -- with a corresponding orbital period of 3.6 to 13.8 days (Endl and Kürster, 2008), while the NASA Star and Exoplanet Database has calculated a slightly farther out habitable zone between 0.033 and 0.064 AUs around Proxima. In any case, the rotation of such a planet would probably be tidally locked so that one side would be in perpetual daylight and the other in darkness. Three star spots may have been observed recently with the Hubble Space Telescope (Benedict et al, 1998). Like many red dwarfs, Proxima is a "Flare Star" that can brighten suddenly to many times its normal luminosity. Its flares can roughly double the star's brightness and occur sporadically from hour to hour. Moreover, more than one flare may be emitting at a time. From May to August 1995, several flares were observed with changes within a time-scale of weeks, and archival data suggests that the star may have a long-term activity cycle (Guinan and Morgan, 1996). It is chromosperically active with a rotation period as short as 31.5 +/- 1.5 days but may possibly as long as 84 days -- and an activity cycle from 442 to 1,100 days -- and appears to be between five and six billion years old (Endl and Kürster, 2008; Benedict et al, 1998; Hunch et al, 1998; Cincunegui et al 2007; and Guinan and Morgan, 1996). Its designated variable star name is V645 Centauri. Other useful catalogue numbers for Proxima include: Alp Cen B, Alp2 Cen, Gl 551, Hip 70890, and LHS 49.
before flaring suddenly again after several hours. Using data collected up to early 1994, astronomers using the Hubble Space Telescope discerned a 77-day variation in the proper motion of Proxima (Benedict et al, 1994). The astrometric perturbations found could be due to the gravitational pull of a large planet with about 80 percent of Jupiter's mass at a 1994 separation from Proxima of about 0.17 AUs -- 17 percent of Earth's orbital distance in the Solar System from the distance, or less than half Mercury's orbital distance. The Hubble astrometry team calculated that the chance of a false positive reading from their data -- same perturbations without a planet -- to be around 25 percent. distant Alpha Centauri A and B at upper right, as imagined by Whatmough. In 1996, another group of astronomers using the Hubble Space Telescope discovered that they might have directly observed a companion to Proxima with the implied brightness of a brown dwarf and an apparent visual separation of only about half the Earth-Sun distance -- 0.5 AU (Schultz et al, 1998). A substellar companion at that distance would imply an orbital period of around a year, or it could be in a highly eccentric orbit with a much greater average distance from Proxima. However, later observations by other astronomers using interferometric astrometry and recent radial velocity data found no evidence to support the existence of a companion greater than 0.8 Jupiter mass with an orbital period around Proxima Centauri of between one and about 2.7 years (Benedict et al, 1999). Proxima has been selected to be one of the Tier 1 target stars for NASA's Space Interferometry Mission (SIM) -- which is planned for launch as early as 2011 -- to detect a planet as small as three Earth-masses within two AUs of its host star. Many dim, red (M) dwarf stars exhibit unusually violent flare activity for their size and brightness. These flare stars are actually common because red dwarfs make up more than half of all stars in our galaxy. Although flares do occur on our Sun every so often, the amount of energy released in a solar flare is small compared to the total amount of energy that Sol produces. However, a flare the size of a solar flare occurring on a red dwarf star (such as Proxima Centauri) that is more than ten thousand times dimmer than our Sun would emit about as much or more light as the red dwarf does normally. Flare stars erupt sporadically, with successive flares spaced anywhere from an hour to a few days apart. A flare only takes a few minutes to reach peak brightness, and more than one flare can occur at a time. Moreover, in addition to bursts of light and radio waves, flares on dim red dwarfs may emit up to 10,000 times as many X-rays as a comparably-sized solar flare on our own Sun, and so flares would be lethal to Earth-type life on planets near the flare star. Hence, Earth-type life around flare stars may be unlikely because their planets must be located very close to dim red dwarfs to be warmed sufficiently by star light to have liquid water (about 0.007 AU for Proxima), which makes flares even more dangerous around such stars. In any case, the light emitted by red dwarfs may be too red in color for Earth-type plant life to perform photosynthesis efficiently. The following star systems are located within 10 light-years of Alpha Centauri AB. Try Professor Jim Kaler's Stars site for other information about Rigil Kentaurus (Alpha Centauri A) at the University of Illinois' Department of Astronomy. Up-to-date technical summaries on these stars can be found at: the Astronomiches Rechen-Institut at Heidelberg's ARCNS pages on Stars A and B and Star C; the NASA Stars and Exoplanet Database for stars A, B, and C; and the Research Consortium on Nearby Stars (RECONS) list of the 100 Nearest Star Systems. Additional information may be available at Roger Wilcox's Internet Stellar Database. For more discussion about the suitability of this star system for terrestial life, go to Laro Schatzer's website on Alpha Centauri. Alpha Centauri is not visible in much of the Northern Hemisphere, as Constellation Centaurus cannot be viewed from middle northern latitudes of around 40 degrees, but should become more easily visible to observers that travel south of the equator. 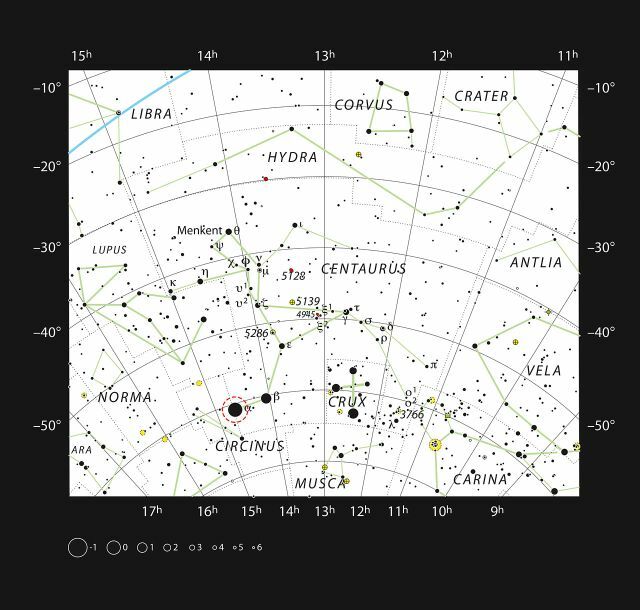 For more information about the stars and other objects in this constellation, go to Christine Kronberg's Centaurus. For an illustration, see David Haworth's Centaurus. Note: Thanks to Andrew James for notifying us of updated orbit information for Stars A and B and to Aaron Freed for new calculations of the apparent brightness of Stars A and B on planets orbiting in the water zone of each star. © 1998-2015 Sol Company. All Rights Reserved.